Absorption: PAL absorbent backing boards absorb the excess moisture of any sliced product without over-drying it. (This is particularly important for salmon and other fish products). Increased Shelf life: Their well-studied formulation enables your product to remain fresh for longer, by guaranteeing low residual O2 levels in MAP applications and by preventing the reproduction of bacteria, unlike paper boards, which would otherwise downgrade the product fast. This also greatly minimizes the chance of your product becoming unsuitable for consumption before its Best Before Date. Vertical display of your product: The well-studied micro perforations on their surface and their rigid structure enable your products to be displayed both vertically and horizontally. 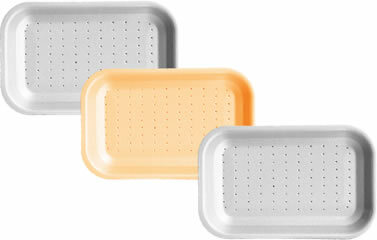 PAL absorbent backing boards are available in various colors in order to enhance the appearance of your product as required: Either by creating a nice color contrast or by being invisible through exact matching of the color of the product being packed. For the processor there are benefits from a logistics point of view as well as the boards are ultra-light and take up limited space, which helps with the costs of transportation and warehousing.